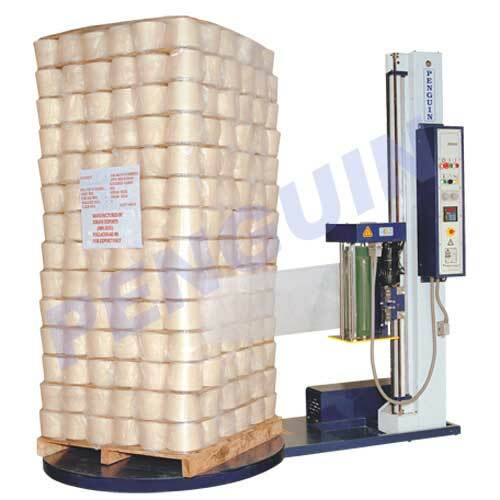 This machine is used in many countries for wrapping pallets with pre-stretched cling film. 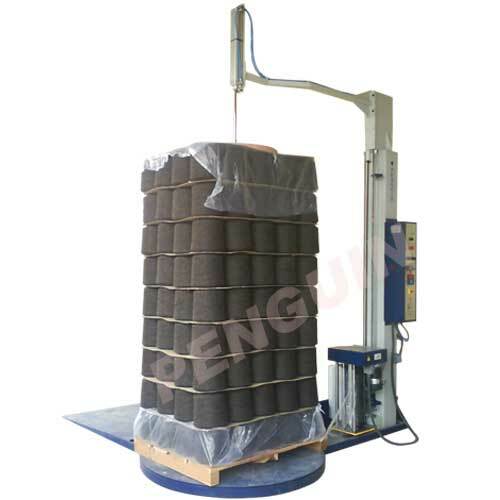 It ensures stable and moisture-proof wrapping of pallets at minimum cost. Optimum wrapping of pallets using wide range of film material is made possible by the state-of-the-art "Powered Pre-Stretch Unit " which can stretch the film up to 300% (One meter long becomes 4 meters long). Powered Pre-Stretch unit has a separate motor to stretch the film. Stretch wrapped Pallet of yarn cones. The picture shows 432 cones of 2 kg each stacked on a pallet of size 44" x 44". The cones are stacked in 12 layers of 36 cones per layer. Ten such pallets can be stuffed in one 20 feet container. 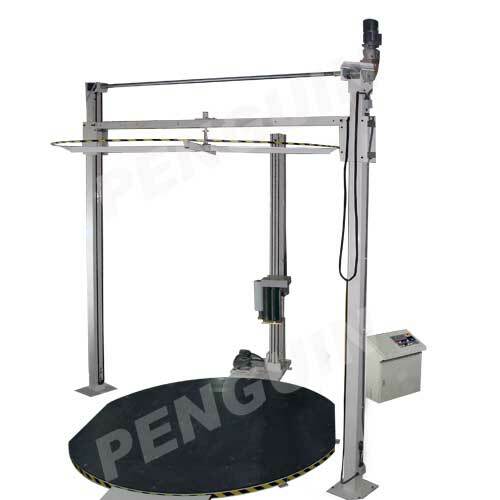 Penguin stretch wrapping machine with customized turn table with 3.2 meters round. 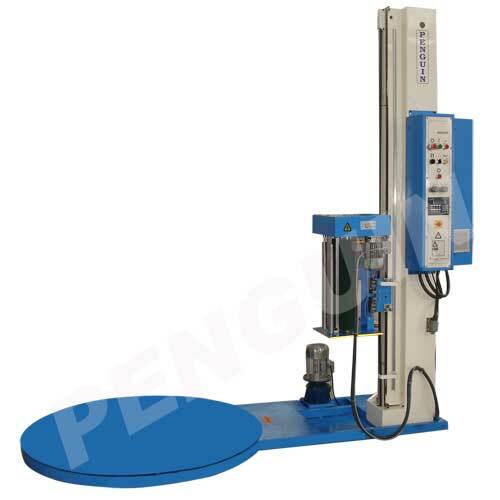 Penguin pallet stretch wrapping machine with top platen for unstable products. Seen in the photo of a woolen cheese packed using stretch wrapping machine. 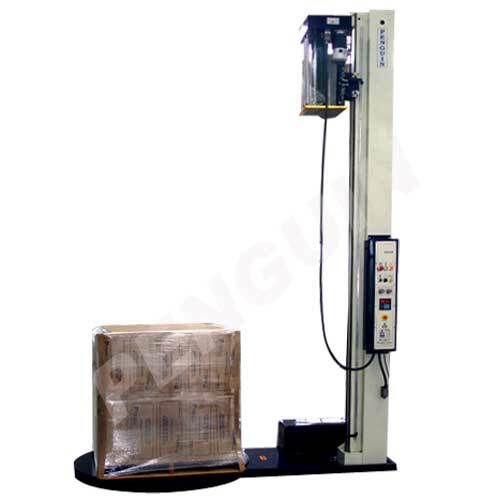 The Stretch Wrapping Machine (Model Classic) is using 220 V, single phase, 15 Amps, & 1.5 KW power supply. The cycle of operation can be programmed and monitored through a micro-processor interface. It is easy to operate & very simple to maintain; it is sturdy & user friendly. In many cases we can load more quantity of our Goods by reducing / eliminating use of wood / corrugated boxes etc., thereby conserving natural ecology. Thus the savings in packing material costs, and the profits due to additional quantity of goods exported in each containers (due to less tare weight) pay back its cost of investment very quickly, say by the time when 25 – 30 container loads are exported using this machine. The Model: CLASSIC is highly suitable for most of the industries exporting their goods in huge volumes. Composite Textile Mills can use this machine for internal transportation of Yarn from Spinning to Weaving section, similar to transportation of TV cabinets explained above. Advantages like savings in Labour cost, in time taken for loading & unloading, clarity of Goods for customs-inspection, moisture & dust proof packing etc., attract both the exporters & importers. This model has been installed in many countries like United Kingdom, Bahrain, Bangladesh, China, Japan, Malaysia, Sri Lanka, U. A. E., Venezuela, Indonesia, Egypt, Fiji Islands, UAE, Greece, Mauritius etc.